One of my hobbies is to study innovation and gather innovation frameworks. When you look at the instruments of innovation, you get ideas to borrow from. A bit of background – I conduct workshops on exploring innovation and mentor innovation cells at colleges (two so far). So, when I found the largest innovation initiative in the world, I could not resist creating this post. Disclosure. 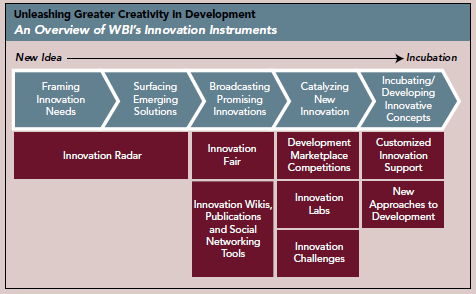 All the (indented) content below comes from the World Bank Institute’s Innovation Brochure. Please head over there to study it in more detail. Participate, if you can. Some Thoughts on Service Business vs Product Business in Software. 1. In a service business, the customer tells you his problem and you provide a solution. In the product business, you discover a set of customers with a problem and come up with a solution. Or you dream up an idea and find customers who can use your product. 2. In a service business, you build a custom solution that the customer pays for. In the product business, you build a generic solution that you or your investors pay for first and hope that many customers will pay for later. 3. In a service business, the customer gives you a spec. You build to that spec. In product business, there is no spec. You make up one. If you are smart, you may build a minimum viable product and see whether you can get some customers to use it and pay for it. 4. In the service business some of the projects may be migrating from existing systems, improvements to existing systems or just maintenance work. You may be constrained in the tools you use. In a product business you have the freedom of space (domain), architecture, technology and tools. 5. In a service business, some of the risks are mismanaged expectations, communication problems with customer and changing specifications. In the product business your risks are finding your ideal customers and keep delivering superior value. 6. In a service business, you may have a cash flow problem but revenues are predictable, since you will be charging for time spent. In a product business, you don’t have guaranteed revenues unless you figure out the right business model. 7. You can bootstrap a service business with just your skills and reputation. In the product business, your bootstrapping strategy would be to build something valuable and find paying customers quickly. 8. In a service business, there are low multiples. You get paid for the work you do. If you are smart, you will build yourself a set of tools that will let you deliver higher quality systems, faster. In product business, there are either no multiples (if your product does not take off) or high multiples. You have a chance of getting exponential revenues disproportionate with your initial investment. 9. To grow a service business you growth is linear and depends on the number of customers, number of employees and number of locations. In a product business your growth can be non-linear and does not depend as much on locations and employees. There is a much higher dependency on the number of products and customers. 10. In product business, you may be the next Microsoft, Google, Facebook, Salesforce.com, Intuit with millions of users. In service business you will be more like Accenture, EDS, Infosys, TCS. The barrier to entry is much higher in service business than product business (example are Google, Twitter, Facebook). 11. Innovation drives product business. Implementation and Service quality drives service business. One is not necessarily better than the other. But you will notice that product business requires different company culture from a service business. This is by no means an exhaustive list. I have taken some liberties and made some grossly over simplified statements. But you get the drift. Please add your comments to expand the list. I keep getting this question a lot – why don’t we build products like many US companies? We at Chennai, do not yet have a product culture, like they do in Silicon Valley or Boston or Austin. When we don’t have something we need, we should go ahead and create one. Creating an eco-system is not as difficult as it seems. It may take a while. But we need to get started. Here are some initial thoughts about creating a product culture in Tech. 2. We need a set of supporters. These can be people who test and use these products and provide constructive feedback. They are the early adopters or micro-investors or marketing, communication and sales people. We need to get them involved right in the beginning and get regular feedback on how to communicate the value and get some publicity. We can use some help from bloggers, Tweeters, tech columnists and any one who can add value in some way. So we need a community where all of us can come together. 3. We need some evangelists. These are people who encourage the builders and supporters and spread the word. They fill the knowledge gap between the producers and consumers. They are essential to the next stage of building the product culture. 4. We need to take this cycle of building-supporting-evangelizing into various places – colleges, informal communities (like the Open Coffee Clubs), more formal communities like TiE and NASSCOM. We need them to support and spread the word and get involved. They can help create awareness and reach beyond the smaller communities. 5. We need events – Product show cases (like proto.in, headstart), discussions, meetups, tweetups, tech meets, unconferences, hackathons, sprints. Some of them are happening already. 6. We need to get companies involved. These may be big IT companies or global software companies. The most valuable contribution they can make is to provide channels for the distribution of these products. You can think of companies like Amazon, Google, Microsoft who are already active in India. They can sponsor events, send in experts and provide lots of useful advice. 7. Finally, we need to get the students involved. Once we know how to build these mini-products, we can communicate that knowledge. Almost every student needs to work on a good project in their final year. So we need to start early and get them involved. We can work with NEN (National Entrepreneur Network) to reach out to students. We need to get this going. We need to raise awareness and build competence. We need to show first and tell later. This will increase the credibility. We need to start creating this mindset and demystify the process. We need to start this chain reaction – as soon as we can. At the panel on Scaling Businesses at TiE Chennai Unconference on Sep 18th. The panel consisted of three charter members of TiE and two eminent people one from Thoughtworks and one from a Govt body. Raghu Rajgopal – Energeate (a serial entrepreneur and helps Chennai Fund). How Can We Keep The Conversation Going? We had great un-conference, the first ever in TiE Chennai, yesterday. The energy and enthusiam were awesome. It is nice to see people engaged, deep in discussions. The whole thing was self organized. You decided the topics, you participated in discussions, you hung around in hallways and started conversations. There were some great discussions. I will write a few blogs about the event and the sessions. But one question keeps popping up in my mind. How can we harness the energy and enthusiasm and keep the conversation going? I have listed a couple of my thoughts below. Please feel free to add yours to this list though comments here or elsewhere. There are a few other thoughts related to working with other organizations. How can we work with NEN, Nasscom, Chennai Open Coffee Club, The Startup Centre and other organizations in Chennai that attract entrepreneurs? How can we work with other communities to cross pollinate ideas? Automobile, bio and a few others were mentioned during the wrap-up session. Energy was already there. How can we seed the unconference sessions with experts who enrich the session value? Should we keep it smaller or make it bigger? Should we charge and try to include some expert sessions and keynotes? How do we spread the word to make sure that people who can start conversations can all attend? How can we keep the essential lightweight nature in planning and running the event? I am sure there are hundreds of other ideas. Please pitch in. As a follow up, we are planning to have an unconference style breakout session at TiECon. Thank you all for being part of it. Let us continue the conversations. Posted on September 18, 2010 Categories Startups and Entrepreneurship10 Comments on How Can We Keep The Conversation Going? Nothing gives a better picture than a picture of what people want to talk about. So here is the latest Topic Cloud of the TiE Uncoference, in black and white. A collocation is two or more words that often go together. Here is more info about collocations. Here are some collocations from the discussion text. I also decided to find out what people wanted to discuss, build, reach, focus during this event. Here are the concordance lists. These are sentence fragments (and not full sentences. Tried to edit it a bit for readability). In a country especially like India and Can geeks really design a product? How to evaluate a business idea ? like is this idea can be a profitable business? How all great guys like you all started initially ? How do we build a team that creates great products ? Which customers to reach out to feedback ? offline marketing efforts so as to reach this target audience ? Having a low pricing model to reach a product to the people. As you can see, even before the event, there is so much people want to talk about. We are hoping that we can capture the tweet stream, blogs and notes from the discussions and do some more analysis. Looking forward to an exciting un-conference and meeting you all. If you are a technology based start-up with an idea for a product, you have to ask yourself a few questions. Here are some questions that come to mind. Whether some one will use the product if you build it? Whether anyone will pay for your product? Whether the product you are thinking about is not already done? Or freely available? Who the early adopters may be and how to connect with them? What the attractive price point for early customers? Who your typical customer is? How to come up with the simplest message to convey the essence of your product? It is worth thinking about these and other similar questions. You may find some of the answers doing research on the internet or selectively tracking social media. You may find some answers talking to a few entrepreneurs who have done it before. You may, however, find a lot more by creating a very simple subset (a minimum viable product) and just inviting people to use it. In future posts we will look at these and other questions and talk about some techniques for getting these questions answered. Posted on September 14, 2010 Categories Ideas, Creativity, Innovation, Information, Intelligence, Knowledge, Startups and Entrepreneurship2 Comments on How Will You Find? How do you stay competitive? By leveraging emerging technologies. By having a strategy for Competitive Technical Intelligence. What the heck is that? There is an entire book written about it, but here is the essence in 3 bullets. There is, of course, a lot more. An entire course, a book, several blogs and wikis. But this may be a good starting point. This is brilliant. May be worth experimenting in a few classes especially since we are trying “project based learning”. Will it work for all subjects? instead of lecturing about polynomials and exponents during class time – and then giving his young charges 30 problems to work on at home – Fisch has flipped the sequence. He’s recorded his lectures on video and uploaded them to YouTube for his 28 students to watch at home. Then, in class, he works with students as they solve problems and experiment with the concepts. Lectures at night, “homework” during the day. Call it the Fisch Flip.